The excitement of an engagement can also come with the stress of planning out your special day. But the more prepared you are beforehand, the more you can minimize this stress. Here are some helpful tips to keep in mind when creating your wedding timeline and hiring your wedding decorator. When you hire your wedding decorator will depend on how much time you have between your engagement and wedding. Typically, it's better to hire a decorator about 6-12 months prior to your wedding, but you can hire a decorator closer to the wedding date depending on their availability. Who should you hire? That depends on what you're looking for. You'll have to ask yourself a few questions before hiring a decorator. Are you planning an extravagant day or an intimate gathering? Do you need florals from your decorator or are you getting them elsewhere? Does your dream decorator work within the area of your venue or will they need to travel far to get there? A good way to start your search is to ask family and friends for recommendations. Otherwise, you can search local business listings or look around online. Once you've narrowed down a list of decorators, check out their websites and social media channels. This will give you a sense of their style of decorating and the products and services they offer. When you find a decorator whose style aligns with your vision, reach out to them. Many decorators offer a free consultation, where you can set up a time to meet with them and discuss your dream decor and budget. Once you find a decorator who is within your budget and offers the decor you're searching for, you're ready to start planning. In the months leading up to the wedding, it's important to keep your decorator in the loop about when they'll be able to get into the venue to decorate and any other information that may arise during the planning phase to minimize stress and ensure your wedding day runs smoothly. What advice do you have for couples looking for a decorator? What is the timeline you followed? Let me know in the comments below! Planning your wedding is an exciting experience. There are many different aspects to plan including food, a colour theme, venue, decor and much more. When it comes to decorating, many of today's brides-to-be are jumping on the DIY trend. While this can be an excellent way to get more involved in your wedding day, sometimes making your own decor can add unnecessary stress if you're not aware of all the little details involved. To help you decide what to DIY, I've compiled a list of wedding decor items and whether you should DIY or use a decorator for each. A backdrop and ceiling treatment are huge tasks that are best left to a decorator. There are many elements involved in planning and setting up a backdrop and ceiling treatment. For a backdrop, you need large pillars, a specific type of linen and lights in some cases. Hiring a decorator to do this job allows you to avoid dealing with heavy pillars the day of your wedding. A ceiling treatment requires a lot of time and creativity. A decorator will take over the task of climbing a ladder, arranging organza and pinning the treatment to the ceiling to prevent it from falling. A decorator can create an appealing ceiling treatment that will add the perfect touch to a reception area. These tables are focal points at your reception, so it's a great idea to leave the details to the decorator when it comes to setting up the head table, cake table and signing table. A decorator can set up linens, tableware, string lights and add small details that are often overlooked and require special attention. While you can order linens from a local party supplier yourself, it may be a better option to go through a wedding decorator. They can outsource linens, which provides you with a greater variety and often a cheaper price. If you're planning on having chair covers at your wedding, I recommend you get a decorator to attach sashes and bows to them because this can be a tedious and time-consuming task. The decorator can also pick up the linens before your wedding and drop them off after, so you don't have to go through the hassle - especially if you're planning on heading off on your honeymoon right after your wedding. If your wedding is taking a place at a venue that requires table set up, this job is best suited for the decorator. Table set up usually requires custom order of glassware, flatware and napkins. If you're not familiar with table setting, this task is better suited for a decorator. Using their experience and knowledge, they can choose dinnerware that best fits with your decor and theme. A table seating chart is a great DIY project that a bride and her bridesmaids can take on before the wedding. Since the bride will already be planning who is sitting together, it can be a simple task that involves a bit of creativity and some Pinterest inspiration. 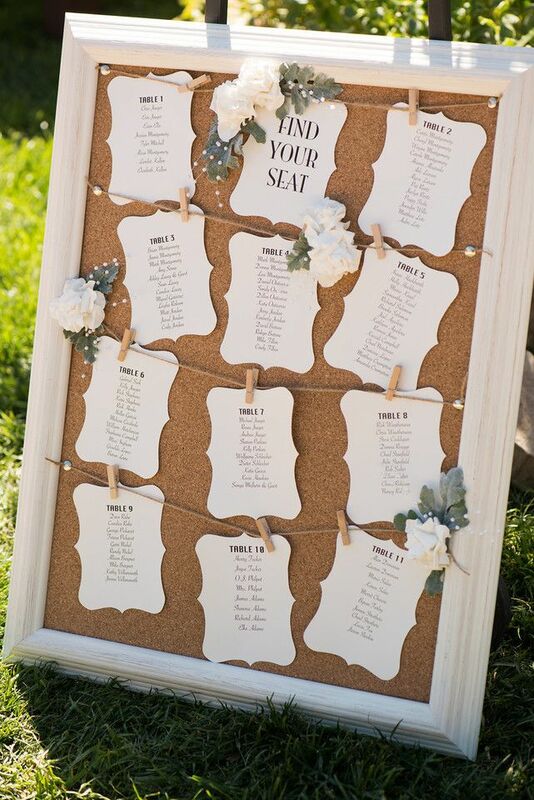 Check out this DIY cork board seating chart. Similar to a table seating chart, favours can be the perfect DIY project. Grab your bridesmaids or family and make a night of putting together favours for your wedding guests. It can be a great way to get your family and friends involved in wedding preparations. Whether you should use a decorator for centrepieces or DIY depends on the complexity of the centrepiece. If you're planning on an elaborate centrepiece, leave this task to your decorator. You'll also want to include your florist if you plan to use real flowers. If you prefer something simple, you can make your own using examples from wedding magazines, Instagram or Pinterest. Although most brides have great intentions when it comes to decorating their wedding and trying out DIY projects, there are many little details that often go overlooked without a decorator's input. For example, decorators will be informed about when linens need to be picked up and dropped off, which colours coordinate well together and how to drape material in an appealing way. Since a wedding is one of the biggest days in your life, why not spend a little extra and get a professional decorator for the more difficult tasks. You can always work out a budget with your decorator that works best for you. Having them help you out with important wedding preparations can help alleviate stress and allow you to have a beautiful and relaxing wedding. To view previous weddings I have decorated, check out my gallery here.